Are you looking for good quality and reliable team offering delivery services? 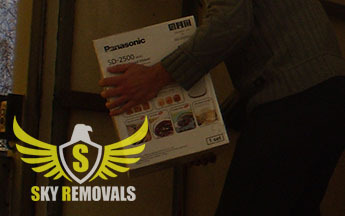 If so, know that you can stop searching as we from Sky Removals provide the best delivery options in London. We are fully licensed contractors and we have numerous years of experience under our belts. We have a rock solid reputation of doers that always get the job done, so rest assured that we will successfully haul your goods from point A to point B. The scale of your delivery project won’t be an issue as we have the manpower and technical capacity to easily handle even the most demanding and laborious jobs. Throughout the years we have managed to maintain a 100% completion ratio and more importantly to always meet our deadlines due to the fact that we work in a punctual and diligent manner. For us the satisfaction of our clients is of paramount importance, so rest assured that we will give a 110% effort to meet all your demands and expectations. We have a huge fleet of new and clean vans and trucks which we have fitted with the latest and most accurate navigational systems. The cargo sections of our vehicles are equipped with safety straps and belts and are large enough to easily hold any volume of goods. Our vans and trucks are driven by seasoned and skilled drivers who will take all the necessary precautions to ensure the in time and safe delivery of the hauled items. Also bear in mind that we from Sky Removals have a full good in transit insurance. You can see how much our assistance will cost you by either giving us a call or sending us an e-mail and requesting a quote. Keep in mind that our quotes are final which means that we won’t shock you with hidden fees and taxes once we have completed your delivery project. Also know that our quotes are free of charge and free of obligation. You can learn more about our company and delivery services by exploring our company website. Also, don’t be timid to contact us directly. Our polite and friendly phone operators will happily answer to all your questions and provide you additional information about us. As you already know, we operate in the English capital, London. The city is one of the largest in Europe and has an estimate population of 14 million people, metropolitan areas included. It was founded by the Romans during the 1st century and is currently the biggest and most populous city in the United Kingdom. London is also one of the most visited cities on the planet.